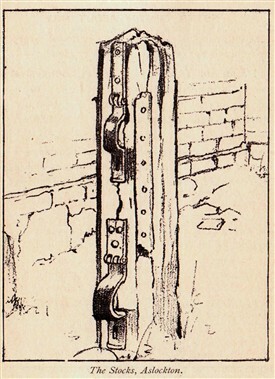 This drawing of the STOCKS at Aslockton comes from J. Potter Briscoe's Bypaths Of Nottinghamshire History (Nottingham: Derry & Sons, 1905, p.124). Briscoe says the sketch was made by Mr. Tom Browne R.B.A. If you can add any further information regarding the Stocks at Aslockton, please leave information via the 'Comments' link below. Where, for instance, were the stocks located in the viallage? This page was added by Website Administrator on 08/05/2014.